Valley fever is a fungal infection most commonly seen in the desert regions of the southwestern United States. The fungus lives in the soil where it dries into delicate strands. When the soil is disturbed — even just by walking on it or by strong winds — those strands break up into smaller spores which are then inhaled into the lungs where the infection begins. According to the Valley Fever Center for Excellence at the University of Arizona, “About 70% of dogs who inhale valley fever spores control the infection and never become sick.” In those that do, the effects of the disease can range from mild to severe and can occasionally be fatal. Both people and animals can get valley fever but they do not transmit the infection between one another. Valley fever is considered non-contagious. If multiple animals or humans are affected in a household, each infection was acquired independently by inhaling spores from the same environment. How common is valley fever in dogs? 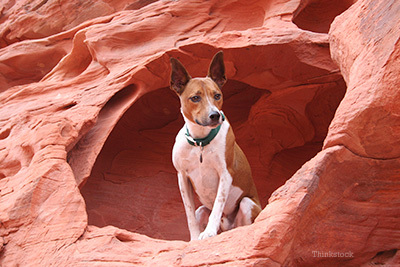 A study, run by the Valley Fever Center for Excellence, sampled 60 dogs in Arizona and estimated that about “4% of dogs will become sick with valley fever on an annual basis.” They expect that dogs in the low desert regions of Arizona, New Mexico, southwestern Texas and the central deserts of California are at greater risk. What are the symptoms of valley fever in dogs? In addition, there is a specific blood test that does not identify the organism itself but does test for antibodies against the valley fever fungus; a positive result indicates that your dog was infected with the organism. If you live in an area where valley fever exists, or even if you and your dog have travelled to such an area recently, your veterinarian will likely recommend this test anytime your dog exhibits symptoms consistent with the disease. It’s important that you give your veterinarian your complete travel history if your dog gets sick — and especially if your veterinarian is having a difficult time arriving at a diagnosis. Can valley fever be prevented? Unfortunately, there is currently no vaccine available to protect your dog against valley fever. That means that the only way to prevent an infection is to not live, or travel through, an area where the fungus grows. Yes it is, and most dogs with valley fever do recover from their illness when treated appropriately with antifungal medications and supportive care. However, the course of treatment can take months or years — with some dogs even needing lifelong medications. It’s extremely important that you follow your veterinarian’s recommendations carefully.